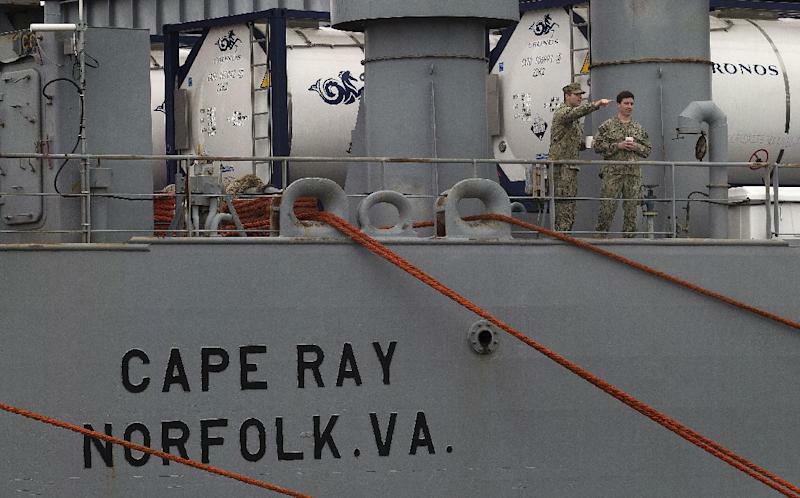 ROTA, Spain (AP) — The American ship MV Cape Ray arrived Thursday at the Spanish naval base of Rota for crew rest and refueling ahead of an unprecedented mission to collect and destroy highly toxic substances that form part of Syria's chemical weapons program. 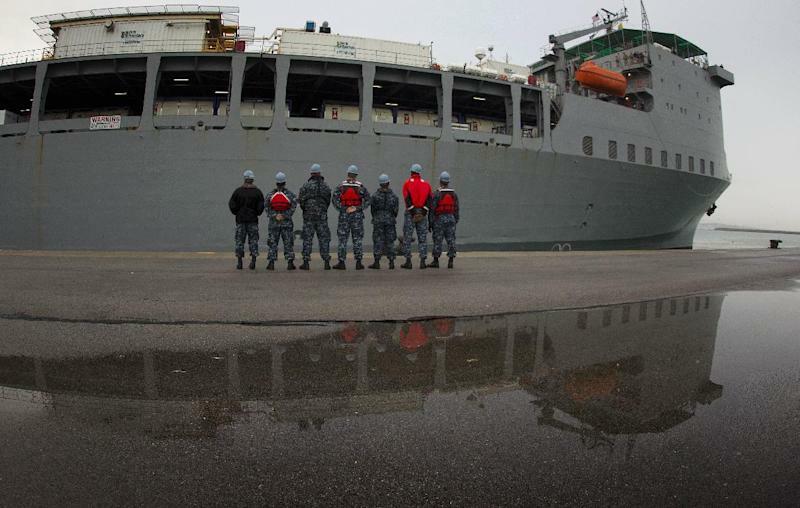 The ship, which left Portsmouth, Virginia Jan. 27, will leave Rota when Syria has completed removal of its chemical materials and proceed to the transloading port in Italy, Defense Department spokesman Col. Steve Warren said in a statement. WHAT IS THE MV CAPE RAY? It is a giant U.S. government cargo ship, usually based in Virginia, which has been fitted with two machines designed to neutralize hundreds of tons of the most toxic chemicals, including mustard gas and the raw materials for sarin nerve gas, that are being removed from Syria as part of the international effort to destroy its chemical weapons program by mid-year. The 648-foot (197.5-meter) ship is typically used in relief operations after natural disasters such as the Haiti earthquake and Hurricane Sandy. It has a crew of about 35 civilian mariners and some technical experts on board. HOW WILL THE CHEMICALS BE DESTROYED? Bolted into the Cape Ray's cavernous cargo hold are two machines called Field Deployable Hydrolysis Systems. They consist of mazes of tanks, tubes, cables and electronics that will mix the Syrian chemicals with heated water and a cocktail of other chemicals in a titanium reactor to render them inert. More than 60 experts needed to operate chemical destruction machinery, as well as security and support staff, are expected to be on board by the time it starts picking up chemicals. WHERE DOES IT GO AND WHAT DOES IT DO NEXT? After leaving Spain, the Cape Ray's next port of call is expected to be Gioia Tauro in southern Italy, where experts from the Organization for the Prohibition of Chemical Weapons say it will take on board 560 metric tons of chemicals that have been transported from the Syrian port of Latakia in two cargo ships from Denmark and Norway. WHERE WILL THE DESTRUCTION HAPPEN AND WHAT HAPPENS TO THE HAZARDOUS WASTE? Officials have not revealed the exact location of the destruction, though U.S. officials say it will be somewhere in the Mediterranean Sea. The only thing that is clear is that it will be on board the Cape Ray and is supposed to be completed by March 31. However, that deadline looks tough to meet due to delays that have already hit efforts to remove chemicals from Syria. The destruction process on Cape Ray will generate hundreds of tons of chemical waste that will be stored on board and eventually destroyed on land. Germany has said it will take 370 metric tons of waste generated by the destruction of mustard gas and incinerate it at a specialized government facility. A statement from the U.S. Embassy in Madrid said no hydrolysis byproducts will be released into the sea or air. The disarmament process is risky from beginning to end, but those in charge stress that equally hazardous chemicals are neutralized on a daily basis around the world. The operation marks the first time the Nobel Peace Prize-winning OPCW has overseen the destruction of a chemical weapon stockpile in the midst of a raging civil war. Just getting the chemicals to port was a challenge, amid fears that rebels or terrorists could target convoys. 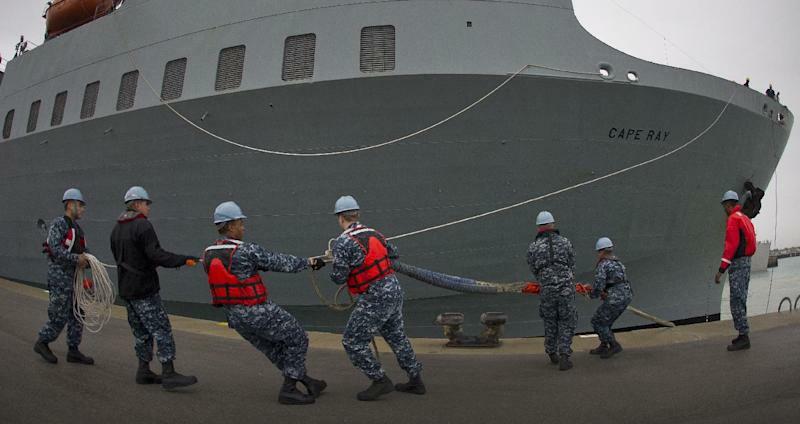 Destroying chemical weapons at sea, as is happening on the Cape Ray, also is unprecedented. But U.S. officials say the process is a proven, safe way to neutralize toxic chemicals and that no vapor or water runoff will be released into the atmosphere or sea as a result.